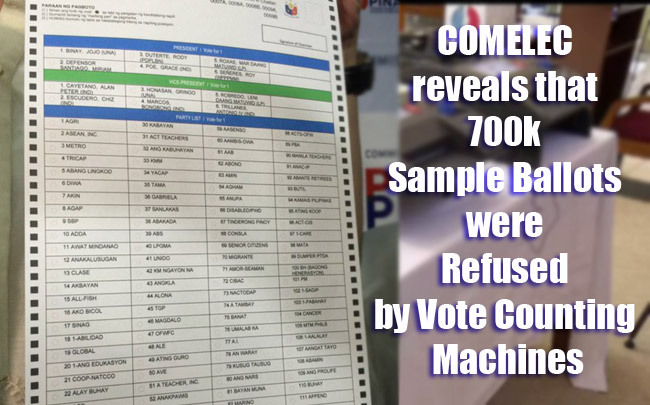 Last April 12, the Commission on Elections (COMELEC) revealed to the media that 700,000 of their sample ballots were defective and refused by Vote Counting Machines (VCM’s) but they insists that it will not be use for cheating this coming May 9 election. The head of printing committee, Atty. Genevieve Guevarra said on her interview with the press that the defective ballots were usually quarantine such as ballots that were miscut and added that they already ordered for reprinting. The poll body has reportedly finished the ballots that will be use to the national election and is expected to be verified this coming April 18. Guevarra also revealed that they did it at once on printing but there were some problems that’s why the verification was slightly backlog. It can be a test that the ballots will be read by Vote Counting Machines. Comelec now only have 2000 ballots left to reprint and they make sure that the refused ballots will be quarantine for disposal. Guevarra insists that even though they have plans on disposing the refused ballots, they do not want the National Printing Office to release it if they don’t know where they will put it so as of now, the disposal was put on hold for preventive measures even if they cut or shred the refused ballots or writing lines on its timing marks. If you put a line on a ballot, the Vote Counting Machine will automatically refuse to read it and it will be dispose with an approval from commission. There is a proper process on disposing documents from government via national archives. Guevarra also revealed her concerns on what the 700,000 refused ballots can create that’s why they are delaying the disposal and they are monitoring it inside the National Printing Office. They are not releasing these ballots for now for they may not secure it.